It’s everyone’s worst nightmare. Receiving devastating news you may have lost not only your beloved pets… but also your home. This tragedy shook our Animal Emergency Service team at Underwood and brought tears to our eyes. Warning, fetch the tissues before reading. 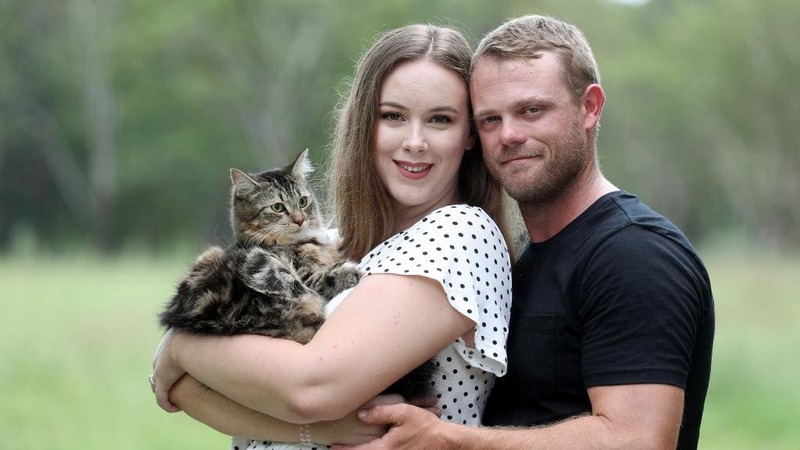 Back in January Liam and Hayley had just started renting their dream property on the beautiful Logan River, complete with three cats, four horses and cattle. It was sadly a dream short lived. Just one week later they lost almost everything as their house and belongings burnt to a crisp in a horrific kitchen fire. At the time of the fire, they were away from home and our AES staff were rattled having to deliver both sets of bad news. Firefighters hurried to save as much as possible and luckily found the three cats huddled together in a corner. After two were revived and showered with cold water they were rushed to AES by ambulance. It’s such a blessing our emergency services are all about working together. By this stage, the cats were in desperate need of help. Thankfully our Animal Emergency Service hospitals are open after hours so can always assist in the unfortunate event of overnight emergencies. While Liam dealt with the house, Hayley raced to AES Underwood to discover one of her cats, Morty, had died at the scene. He was their saviour having laid on top of mum Leah, with Aria beneath her. Their outlines eerily still etched into the walls at the home. On arrival AES vet Dr Kayla Jones treated Leah and Aria with oxygen to assist their breathing difficulties, administered pain relief and lubrication for their eyes, also removing soot from their mouths and fur as best as possible. Although revived at the scene, mum Leah sadly inhaled toxic levels of carbon monoxide, so much so there were soot bubbles blowing out her nostrils. Along with difficulty breathing (Dyspnea), above normal respiratory rate (Tachypnea), plummeting oxygen levels and ulcerations around her mouth and tongue. Dr Kayla also suspected thermal burns in her lower respiratory tract. With such extensive damage to her airways, Hayley made the brave and difficult decision to end her suffering. Our pets are our family and our best friends. No amount of good reasons can make this an easy decision. It never gets easier for our team watching a family have to say goodbye. Hayley originally considered euthanising Aria, however, the tabby was much less affected and her oxygen respiratory rate presented as normal. Little Aria was lucky to have been saved by the brave actions of her mum and brother protecting her from much of the soot. This lucky year and a half old kitten escaped with just a minor burn and some temporary damage to her airways due to the thermal heat of the air. 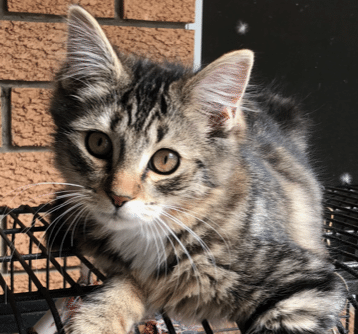 Understandably after losing her mum and best friend, the once playful tabby appears more withdrawn and needy, demanding more kisses and cuddles from her parents. Health wise she is doing well. Aria sure had lots to say in her follow-up appointment! Another great sign she is on her way to recovery. Her cough will also heal over time. Just like humans, traumatised pets require a combo of gentle affection, personal space and time to heal. Ensuring pets have a “safe space” will provide them with somewhere to retreat to if needed. Felines feel safer higher up or and snuggled in enclosed spaces, anywhere they can hide their head, so if needed aid accessibility. If they looking longingly at a window ledge or a wardrobe shelf, create a way for them to reach it (although as we know they are usually fairly agile and determined in finding a way). Our inquisitive kitties will likely explore and pick out their own space being the master hunters of cosy safe spots! Humbled by the experience, Liam and Hayley have already come to terms with their nightmare. An incredible attitude and outlook given their loss. The couple wanted to share some advice to others… Bring the community closer together and make friends with your neighbours. Liam – “We’d Just moved in and hadn’t told the neighbours our phone number yet..”. This small important gesture may have helped saved their house or cats sooner. Our team is so happy to have been able to give Liam and Hayley a small glimmer of hope with Aria amongst the sadness. Despite a rough ordeal, Aria went home relatively happy and healthy, and should be back to her playful old self in no time.